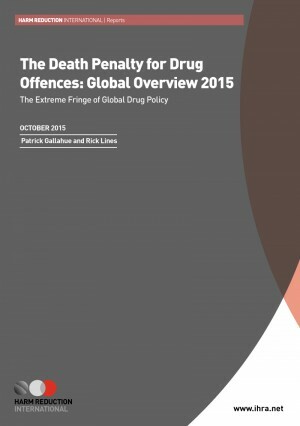 Since being launched in 2007, HRI's death penalty project has been the leading global resource on the issue of the death penalty for drug offences. Our 'Global Overview’ series, one of the project’s main outputs, monitors the death penalty for drugs in law and practice worldwide, and also considers critical developments on the issue. At least 33 countries and territories that prescribe the death penalty for drugs in law. At least 10 countries have the death penalty for drugs as a mandatory sanction. more executions than those publicly recorded. Executions for drugs took place in at least seven countries since 2010. As of 2015, there are believed to be almost 900 people on death row for drugs in Malaysia, Indonesia, Thailand and Pakistan, and many hundreds more in China, Iran and Vietnam.